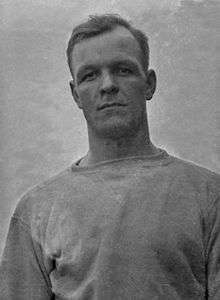 Heartley William "Hunk" Anderson (September 22, 1898 – April 24, 1978) was an American football player and coach. He served as the head football coach at the Saint Louis University (1928–1929), University of Notre Dame (1931–1933), and North Carolina State University (1934–1936), compiling a career college football record of 34–34–4. From 1942 to 1945 Anderson was the head coach for the Chicago Bears of the National Football League (NFL), tallying a mark of 24–12 and winning the 1943 NFL Championship. From 1918 to 1921, Anderson played as a guard for the Notre Dame football team, under coach Knute Rockne. From 1922 to 1926, he played for the Cleveland Indians and the Chicago Bears. In 1939, he coached for the Detroit Lions. Anderson was born in Calumet, Michigan and attended Calumet High School. He was 5'11" and weighed 170 lbs. Anderson was named to the National Football League 1920s All-Decade Team, and is only one of two players on the list not in the Pro Football Hall of Fame. He was inducted into the College Football Hall of Fame as a player in 1974. 6 0 0 1.000 1st in NFL Western 0 1 .000 Lost to New York Giants in NFL Championship Game.